Ivory and bone are primarily used for manufacturing artwork and household items. However, despite their similarities, the two are far from being alike. This article provides information on the differences between the two. Ivory is a variety of a bony tissue called dentin. A rigid, creamy-white substance from the tusks (elongated front teeth or incisors that protrude outside the mouth of a mammal) of elephants, walruses, mammoths, and other animals, ivory is used to either create artwork or manufacture piano keys, billiard balls, and decorative items. 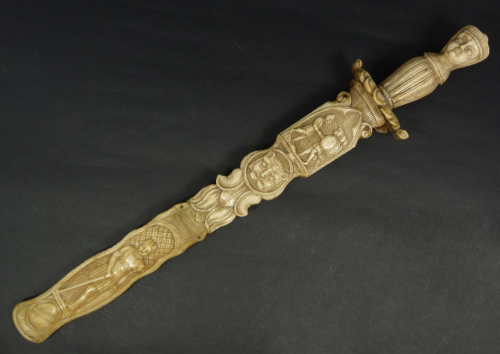 Because of their commercial appeal, products made from ivory became widespread over the years. However, since obtaining ivory endangers mammals like elephants, the acquisition of ivory is now regulated in many countries. Today, ivory imitations are available on the market. Ivory can be authenticated by the use of the hot needle test or the black light test. Bone, on the other hand, is a dense connective tissue that constitutes the skeletal system of most vertebrates. Made up of inorganic mineral substances and compact organic matrix, bones mainly protect and support the body’s vital organs. Aside from its anatomical importance, bone is also used to create and manufacture artworks. In the early years, bone carving became prominent among artisans. Bones are also used to create faux ivory. So what’s the difference between ivory and bone? Firstly, ivory is a rigid, creamy-white substance from the tusks of elephants, walruses, mammoths and other mammals. Meanwhile, bone is a dense connective tissue that constitutes the skeletal system of most vertebrates. Just like hair and nails, ivory is made up of dead cells. Bone, by contrast, has brown or black minute pores which are residues of blood vessels that flowed through the bone. Since the pores are minuscule, they are only visible under a magnifying glass or a microscope. The surface of ivory, on the other hand, is marked by fine lines that are either in circular rings or cross-hatched lines. In terms of rigidity, ivory is harder than bone and it is more resistant to scratches. Because of its denser components, ivory typically weighs more than bone. Ivory is also shiny and smooth, while bone is dry and rough. Unlike bone, ivory can be glued together after breaking into big pieces.